Good news or perhaps great news if you are a resident of California, a former resident of California who still loves the state or just someone who supports good and progressive government. 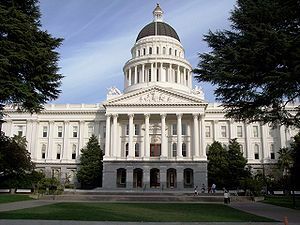 In the election yesterday, Democrats became the majority party in Sacramento in both houses of the legislature, In fact the Democrats now have a super majority in both houses. That means that Grover Norquist‘s influence in the state of California is greatly diminished. Not only is Grover Norquist the guiding evil genius in Washington orchestrating GOP obstructionism, he is also active doing similar work in the states. I have been a member of the Barack Obama Truth Team and as such, I have subscribed to many right-wing blog sites that I would never have read otherwise. One of their favorite topics besides lying about Barack, has been defaming the state of California. I trust that the changes in the party structure in Sacramento will start to change that. A major stumbling block in CA (and one that has led in no small part to the rights criticism of CA and her financial situation- was prop 13 passed in 1978- requiring a 2/3 majority to pass tax increases. Which has, for many of the intervening years gridlocked Sacramento as the population, and needed infrastructure and services have continued to grow without any way to raise taxes to meet those needs. Now- with the D’s having a supermajority- taxes can, and will be raised. But I will call it now – the benefits of those new taxes will not kick in fast enough to forestall a conservative backlash. Too little too late for the GOP. I agree that Prop 13 needs to be reworked or discarded. Two properties side by side are taxed differently depending on how long they have been owned. I own a California property that benefits from Prop 13. I think that Prop 13 also unfairly gives businesses a tax burden that is usually too low.